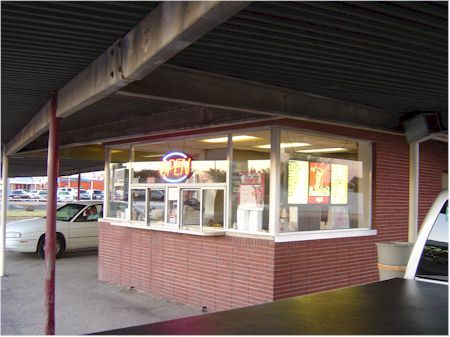 "the west county road original"
Watts Burger has been shut down and torn down. There is still a Watts Burger at 1208 South Grant Avenue, Odessa, TX. Normally I would remove this page but Watts Burger means a lot to my past and I think I'll just keep it. This is not the place to get the best burger in Texas and it is certainly not the worst burger either. This place sells a "memory" burger. In the spring of 1963 myself and two of my fourth grade buddies, Marcus and Gary sneaked off the campus of Cameron Elementary School to eat lunch at this wonderful burger establishment. 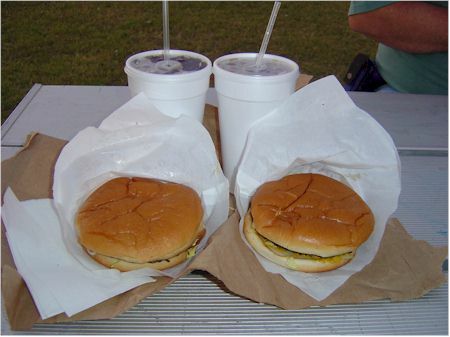 We made ourselves hungry that morning just thinking about how good it would be to forego the usual cafeteria fare and have a big hamburger from Watts Burger a mere 1/2 mile away on West County Road. The lunch period arrived and we had 45 minutes to walk 1/2 mile, stand in line, order our burger, wait for it to be cooked, eat it, and walk a 1/2 mile back to school and more importantly be seated in our classroom. We ended up eating our burger running back to school. When we arrived the school the playground was empty, we were about ten minutes late. Being the smart fourth graders we were, a plan was devised to fool our teacher into thinking we were each late "independent" of each other, thus there was no "conspiracy" to leave the school grounds. What was that plan? Each of us would walk into the class room individually, about two minutes apart. Did we fool our young 24 year old teacher? No! She told us we all smelled like hamburgers. We confessed our transgressions. I don't remember what the punishment was but I'll never forget the adventure. My wife and I pulled into Watts Burger late one October evening on a recent trip to Odessa. We ordered two cheese burgers with jalapeños. As we waited for our order I told the story of my misspent youth. We also watched the people coming and going with sacks of burgers. This place has not changed one bit in 45 years except for two things. For as long as I can remember when you unwrapped your hamburger it had a big cherry pepper on top. I remember at some point as a kid I started eating them before I ate my hamburger. I didn't really like them but I felt it was a right of passage to adulthood. Also the menu has not changed much, but the prices certainly have. 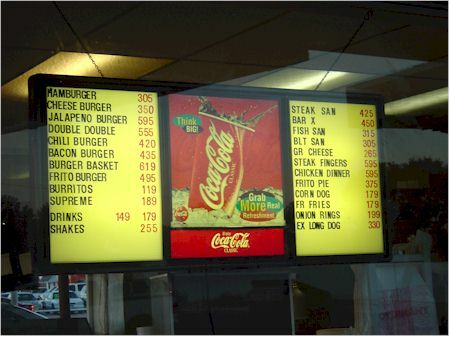 I don't remember what a hamburger cost in 1963 but today at $3.05 its about the same price as a gallon of gasoline. There is not and never has been a dining room. Most customers seem to be taking bags of hamburgers home. When I was growing up that is what we use to do. I've never liked eating in my vehicle so we took ours to Floyd Gwen Park. Now that place has changed, but that is another story for another day.